This project works well with the Raspbian “Lite” operating system; it fits easily on a 2 GB card with room to spare. Do not use the “desktop” images, they’re enormous and contain a ton of things we don’t need for this. 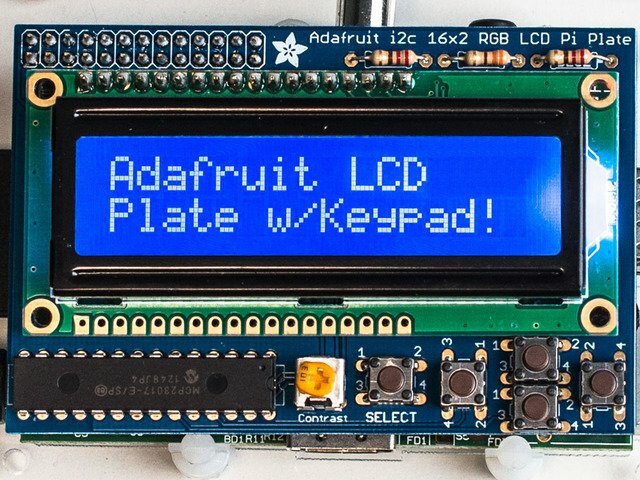 While that’s downloading, you can work on assembling the LCD kit. If you’re new to Raspberry Pi and Linux, we strongly suggest working through the first few guides in the Learn Raspberry Pi tutorial series…know how to “burn” an SD image, perform a first-time setup and get the Raspberry Pi connected to a network. Some familiarity with one of the text editors (such as the simple nano or the more daunting vi or emacs) is also recommended. Install the Raspbian Lite OS on a 2GB or larger card. You’ll need to connect a monitor and USB keyboard for basic system configuration, but this is only temporary…we’ll set it up to run “headless” later. For networking, connect either an Ethernet cable or use WiFi (built-in on some Pi models, else use a USB WiFi adapter). 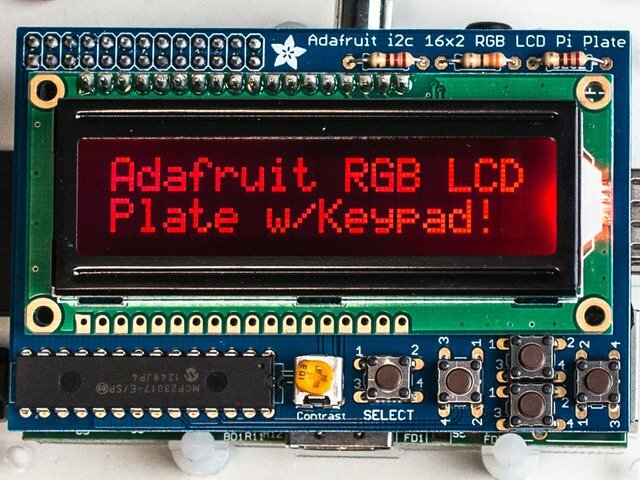 You don’t need to install the LCD Plate atop the Pi yet, we’ll do that later. Let’s just get the basics set up. 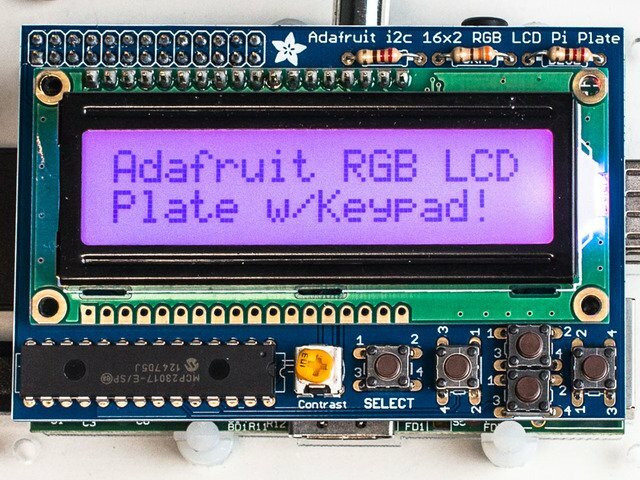 Connect a monitor and keyboard to the Raspberry Pi. Insert the SD card containing the Raspbian OS. 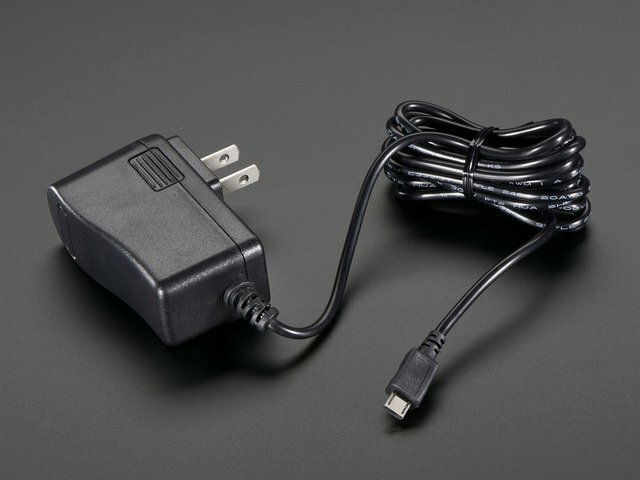 Connect a “Micro B” USB cable to the power connector on the Raspberry Pi. Plug the other end of the USB cable into a power source: a mobile phone charger, a powered USB hub, or simply a USB port on your computer. Linux can be daunting to the uninitiated. 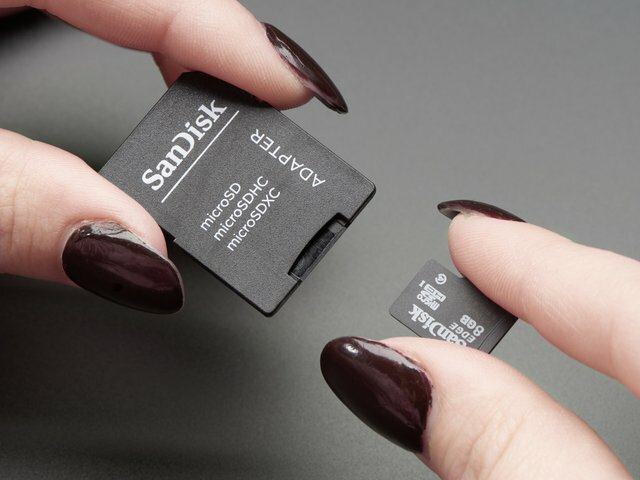 Don’t worry about messing something up…if all else fails, you can re-format the SD card and begin again. On first boot, you’ll get a login prompt. Log in as user “pi,” password “raspberry”. Under “Interfacing Options,” enable I2C. If you’ll be using WiFi, under “Localisation Options,” select “Change Wi-fi Country.” Then, under “Network Options,” select “Wi-fi” to enter the SSID/password for your wireless network. Change User Password (because everybody knows the default). Under “Localisation Options,” select “Change Locale,” “Change Timezone” and “Change Keyboard Layout” to suit your location. If your keyboard isn’t producing the expected symbols, this is why. Network Options→Change Hostname. 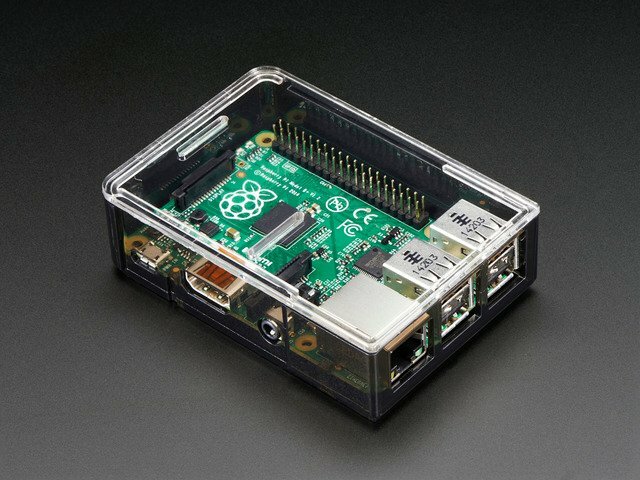 I named mine “pandora” to distinguish it from other Raspberry Pi systems on the network. Interfacing Options→Enable SSH. This allows remote login from another system on the network, for performing administration tasks without a display attached. You can disable Overscan (under “Advanced Options”) if you like — we’ll reboot a few times during the setup process, and this provides a little extra screen real estate on HDMI monitors. Tab over to the “Finish” button, press Return and confirm you’d like to reboot the system when prompted. You’ll need to log in again, using the password you established above. Several configuration files will now be edited. Our examples show the “nano” text editor being used, as it’s easiest for the uninitiated. Power users can substitute “vi” or their editor of choice. 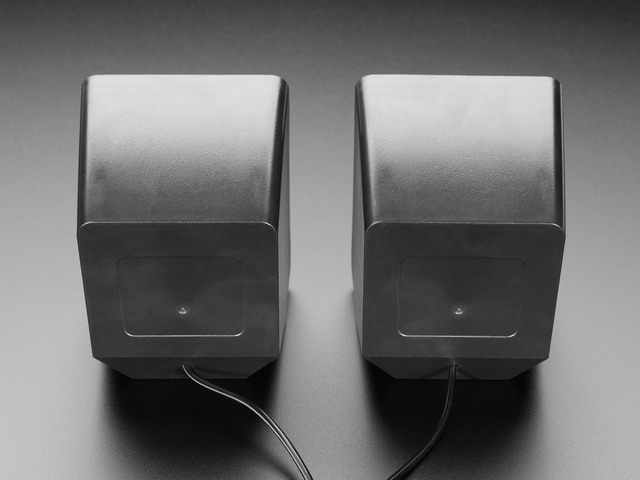 If you plan to use this with a USB Audio Adapter, this guide explains the process. It’s pretty straightforward, a matter of editing one line in a file. Wait for the system to report that it’s halted before disconnecting power. It should take about 20 seconds. Following shutdown, insert the USB WiFi adapter (if using one) and re-connect power (keep the monitor attached for now). Is using a Model A board: you’ll need to remove the keyboard to plug in WiFi, or use a powered USB hub temporarily during setup. Without a hub, ssh is now the only way into the system…so if WiFi isn’t working, you’ll need to unplug the adapter, connect a keyboard and check the WiFi configuration. Do not proceed until internet access is working. If WiFi refuses to cooperate, make sure every step above has been followed carefully. If you’re trying to use a hidden network and it just won’t play nice, change the router configuration to broadcast the network name. You should get a password prompt. Once logged in, you can perform all administration duties remotely (including the steps that follow), and the monitor and keyboard are no longer needed on the Raspberry Pi. It’s easier this way because you can cut-and-paste all the commands with their weird syntaxes. This guide was first published on Apr 12, 2013. It was last updated on Apr 12, 2013. This page (Initial System Configuration) was last updated on Apr 22, 2019.